Don't feel badly about trying to "size up" the coaches during the recruiting process; they're doing the same with you. In fact, if they've been at this any length of time at all, they probably have the sizing up process for recruits down to something of a science. Every coach and every program is, or at least should be, trying to find the athletes that fit. Not all athletes work well with every coach's personality type. Some athletes chafe under the philosophy of a particular program. It's neither good nor bad. To borrow a tired phrase, it is what it is. While it isn't necessarily easy for a coach to determine during the recruiting process whether an athlete will be a good fit with their program, I've seen good evidence from several coaches that they are casting about for the kind of information that will help them make that determination. I've seen recruiting processes dry up on the vine when a coach detected something he/she didn't think would be a good fit. And it's not just the coach doing the detecting. Several coaches will solicit input from their staff and from current team members as well after a potential recruit, or group of recruits, has come in for an visit. Most college coaches are far enough down the road in experience in dealing with people to know and understand the importance of finding the right matches to work with. And, since they aren't high school coaches, they are not nearly as bound to accept whatever personalities come their way and learning deal with it as best they can. Mind you, there is a measure of "dealing with it" that comes with coaching in the college ranks, but the recruiting process provides some measure of control at the front end over what you may eventually end up dealing with. That's not to say there are many college coaches out there who are routinely trimming the field of prospects by two-thirds or more just on perceived personality traits alone. But, there are varying levels of trimming that many, many coaches do engage in when recruiting. Although many parents and many high school athletes think the recruiting processs should be as simple as looking at an athlete's marks coming out of high school, it is not nearly that simple. Marks matter, but they are only part of the equation. Most prospective student athletes aren't nearly as astute at identifying situations and personality types they will have trouble dealing with as coaches are. Yet, athletes are the ones who will be in the subordinate position once a coach/athlete relationship begins, meaning that their stakes in this game are actually higher than the coach's stakes. And so, they enter this game at a bit of a disadvantage. The intent of this article is to level the playing field a little. Throughout the recruiting process, you need to learn to find and read the clues. So, let's look at some of the squares of the board where the game is played. If you have become a Facebook friend of a college coach or recruiting coordinator, your Facebook page is fair game for revealing all sorts of clues about who you are to that coach. Be assured that all of the things a potential employer could see and be concerned about on your Facebook page are the same sort of things a potential college coach could see and be concerned about. This would include any references to drug and alcohol usage, criminal behavior, and simply the general tone and content of threads, comments, and likes found on the page. If you've put it out there, expect to be evaluated by it. Of course, if you are Facebook friends with a college coach or recruiting coordinator, you can return the favor by checking out their Facebook page, but you can be pretty sure those Facebook pages come highly sanitized. People in the working world who aim to keep their jobs have already learned that lesson. It's doubtful you'll learn too much about the coach via his/her Facebook page, but you might learn learn a little. Facebook page inspection, by the way, doesn't end with the recruiting experience. Most, if not all, college athletic departments have restrictive policies about Facebook usage among the athletes within their programs. Figure that the content of your Facebook page will be routinely monitored for inappropriate content the entire time you are part of that school's athletic program. One good way of getting a glimpse into what it's like to run, jump, or throw for a particular coach is to look at the school's retention rate of athletes in that coach's event area over a period of time. In the previous recruiting series I did with Jay Johnson, I suggested doing this by going back through the track and field/cross country rosters of previous years at the school's official web site. That was a reasonably good strategy for a while. Providing compelling evidence that it was a good strategy is the fact that, in the four years since that first recruiting series came out, multiple schools have started deleting names of athletes who stayed with the program only one or two seasons from the archived rosters on their web sites, making it appear as if those people never ran for that school. So, in effect, schools have made it more difficult to check on how well they are retaining the athletes they bring in. But, in the age of the internet, there is almost always a way to find the information you're after. 1. Go to the MileSplit page of the state of the college you're considering. 2. Click on the header for College Commitments somewhere on the front page of that state (the location of this header varies from state to state, but you should be able to find it somewhere on the front page). 3. This will bring up the current year's list of commitments, which won't do you any good for the moment. But, on the right side of this page is a set of links to other years. Click on the year you want. 4. This will bring up the college commitments for that state for the year you just selected. This still isn't exactly what you want, but now all you have to do is to type in the name of the school you want to check on in the Filter by college box at the top of the list. This will not produce a comprehensive report of commitments for that school since not all athletes report their college commitments, but, in many cases, it will give you a nice sample of their recruiting class for that year. 5. Next, go to the school's own athletic web sit and bring up the track and field roster for three or four years later. Determine what percentage of those who signed are still there and compare that percentage with other schools on your list. 6. Repeat this process for a few successive years to enlarge your sample size. Do this with at least this one basic understanding, however: no school will ever have perfect retention. Some athletes underestimate the rigor of college track and field and drop out when they discover what the demands made of them are. They likely would have dropped out regardless of the school they went to. Other athletes sign a National Letter of Intent with stars in their eyes and later realize they aren't up to competing at that level and leave for a smaller school setting. In short, you have to be smart about how you use this information. It should be only one piece of the puzzle for you, but it is still a piece. And, it is one reasonable indicator of how rewarding it is to work under that coach. Please note as well that this analysis is only worth doing if the coach you're considering signing under has been with his/her current school for several years. If he/she hasn't, but was at a different school for the last, say, eight years, you can do the same analysis at that school to gain much the same snapshot. Be careful to make comparisons only between like schools. Don't compare a DIII program to a high level DI program in this manner. There are simply too many elemental reasons for the athlete retention rates to differ where the programs are as different as that. Even comparing a lower-tier DI school against an upper tier DI school doesn't tell you much. Keep your comparisons to similar types of programs if you want the results to mean anything. While you're at the school's official track and field page, there's another potential exercise for you to do. Let's suppose you're the type who is absolutely driven to reach the top of the pile. As best you are capable of assessing yourself, it doesn't matter who your coach is so long as he/she can get you to the top. You may want to look through the roster of your chosen schools with a different question in mind. You'll want to look exclusively at athletes in their last year or two of eligibility. Click on their links on the roster page and read through their athlete bios. Look closely at these athletes' progressions through the years and seasons of college. You may not necessarily stick solely to your own gender in this exercise, but you want to give greater importance to your own gender. You're looking at one marker only--how much improvement do the athletes who have stayed with the program exhibit through the course of their college careers? In doing this you can get a good read on the answer to the question, "If I stick with it, where can this coach take me?" Repeat the analysis with a few different schools at the more or less the same level so that you have good reason to believe that you're comparing results between coaches and not simply comparing one coaches' results to some arbitrary scale you have established. In the give-and-take of phone calls and visits (whether official or unofficial) people tend to be on guard and on their best behavior, but there are clues to be had even so. A big part of drilling down to personality types lies in asking the right questions, and then listening not just for the answer but for the way the answer comes packaged as well. I am not proposing to give you a list of questions here that will help you get down to personality types, to uncover aspects of character that may take a month or two of more routine interaction with somebody to reveal. That's mostly because any time anyone puts a set of such questions out on the table, it becomes way too easy to practice answers to those questions. Once that starts happening, the list of questions becomes rather useless in a hurry. Too often, practiced answers are also insincere answers. It's also because a set of questions that works well for one person may be of very limited utility for another person. The job set before you is more complex than borrowing someone else's list of questions. When making a visit, whether official or unofficial, you don't want to come off as either calculating or canned. You want to ask questions that are natural for you to ask, questions to which you want to know the actual answers as well as the subtext of the answers. If I knew you well, I might be able to help you come up with a few such questions, but that's not something I am capable of doing for a national audience such as the one reading this article. And, again, even if I could do that, the moment I publish a list of questions like that, people on the receiving end of those questions are going to start rehearsing their answers to those questions. At that point, you no longer know if the answers you get are useful or not. 1. Think of your high school coach(es). Maybe even some of your teachers and other significant adults as well. What do you like and not like about dealing with them? And, how are the traits that you like and don't like revealed? Make a list of things that enhance your enthusiasm for doing work for a person and a separate list of things that diminish your enthusiasm for working under a person. 2. Once you have that list, think about how those character traits are revealed. Think especially about any coaches you've had in this regard. Now start crafting questions that will reveal something of how the college coach you'll be talking to handles similar situations. Bear in mind that on an official visit you get to spend some time with team members and ask questions of them as well. If you require a highly organized personality to enjoy working under someone, you should be able to think of a few content questions to which the subtext of the answers will reveal whether a person is highly organized or not. If you enjoy working for someone who makes suggestions in a teasing sort of way, a person's teasing habits are dangerous territory to ask about directly. If you ask about them directly you run a high risk of being perceived as intrusive, but their teasing habits will frequently come out as the subtext to the answer to some safer question. 3. I would always include a few questions that give a prospective coach a chance to talk about other people (and not just their favorite people). Listen carefully not just to what they tell you about other people, but how they talk about other people as well. 4. Make sure you have questions to ask that aren't simply content-based questions. Lead with a few basic getting-to-know-you questions as well. People almost always answer more freely when they sense the person asking questions has some basic level of interest in them as a person. Doing this is almost never a waste of time. In fact, it's a pretty important life skill to have. All great conversationalists have the skill of making the other party to the conversation feel valued. Start practicing that skill now if you haven't already. You can ask what a coach enjoys doing when coaching isn't front and center. It's a pretty safe guess you won't choose a coach to work under on the basis of what he/she likes to do in his/her spare time, but asking that sort of question will tend to open things up and may lead to some unexpected points of contact that make relaxed conversation with that individual much easier. There will be an upcoming article on asking questions (most prospective student-athletes don't come on a visit prepared to ask very many questions), but those questions won't be aimed so much at drawing out personality types as about helping you to see the big picture of the program you're looking into. Sizing up a coach takes some hard work and forethought on your part. The good news is that, if more than one school is interested in recruiting you as an athlete, you will get to field test the questions you come up with, hang onto the ones that work well, and revise the ones that don't. Find a person in your life who knows you well and is wise in the ways of reading people. Ask that person sit down with you and help you generate a few revealing questions. Another productive line of learning more about coaches who are recruiting you is from people you already know, people from your own school or your circle of acquaintances who have run for the coach. If you're not asking those people for a read of what running (or throwing or jumping) in that program is like, you're missing out on an extremely useful source of first-hand information. More importantly, you're running the all the risks of making an important decision with potentially four or five years of consequences on very limited data. Don't be reluctant to find out what there is to be learned from sources near at hand. As you evaluate, though, keep in mind that every program, and every coach, has its share of things you'll like and things you won't like as much. If you're feeling at all squeamish about this, like perhaps if you did this you would be asking a friend to rat on another person, let me take this moment to remind you that any college coach worth the time of day has already asked that person what they know about you. They probably asked in a fair-minded sort of way (and so should you), but they did ask! 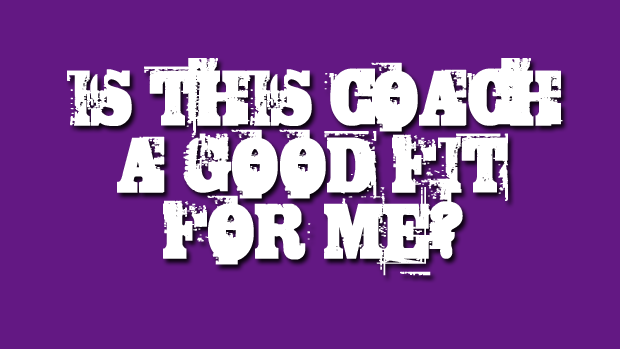 You should ask your current coach what he/she knows about the coach in question. Once again, it's a near certainty that the college college has already talked with your high school coach about you. Sharp college coaches do that sort of thing. You should, too. Is this coach slow or quick to respond to e-mails or calls? Or, am I left hanging a lot? Is this issue important to me in a long-term relationship? When I ask a question, do I get a well thought-out answer (even if it's not the one I was hoping for) or do I get a dashed off reply? Most coaches you will deal with in the recruiting process are very accomplished at presenting a very polished picture of their program. It's a very much like a business for them and presenting their business in the best possible light is essential to their own success. The better skilled they are in getting the top recruits to sign, the more successful they are likely to be as a coach. On the heels of success typically come things like recognition, job satisfaction, and salary advancement. But, in this equation, there's someone else who has a legitimate interest in being satisfied and successful--and that's you. If you don't learn to cut through the polish of the presentation to what's important to you, you run a high risk of setting yourself up for a less-than-optimal college track and field experience.